Our Outdoor Team Building Events are a great means to get out of the daily routine at the office for one day or more. Sharing experiences, not only at work, will result in its success. We provide fun, action, and outstanding moments to be remembered. Even though Team Building is known to be an outdoor activity, the need for Indoor Team Building Events during winter resulted in developing games for indoor halls and conference rooms. Corporate Events are gatherings sponsored by a business firm for its employees, partners, or clients. These events can be tailored for conventions, conferences, meetings or just a company day out. Our objective in Training and Coaching is not just for anyone to know something about the thing; but to be able to do the thing, and do it well. Practice with an expert coach under realistic working conditions will turn potential talent into demonstrable competence. Team in Motion conducts educational summer camp for children or teenagers, where the traditional view of summer camps as sleeping in the woods, hiking, campfires, and playing has evolved to add more specialized activities promoting educational or cultural development. By attending our YES camp, children and teenagers have the opportunity to enjoy moments of fun while also making new friends, gaining or revealing their own skills, and broadening their outlook on life, safety, health and environment. We enjoyed the day with your professionalism, had fun with the creative activities that you proposed and lifted our team spirit with your strategic Challenges. “Team in Motion, vous nous avez presente des activites tres dynamiqes, ludiques et interressantes. “Les Missionnaires de SSCC- Kfarhbab ont temoigne avoir passï¿½ une journee exceptionnelle qui leur a appris beaucoup de lecons juste en jouant et en s’amusant. Merci est la mere de tous les mots. Nous avons beaucoup apprï¿½ciï¿½ la richesse du contenu et le partage des expï¿½riences vï¿½cues. Votre approche a favorisï¿½ l'intï¿½rï¿½t de tous. Le rythme du travail est bien gï¿½rï¿½ et le contenu approfondi. Votre capacitï¿½ ï¿½ favoriser l'ï¿½change entre les participants leur a permis de mieux apprendre du bagage de chacun dans une formation de Leadership. Nous recommandons chaudement cette formation. “The Team Building Event that Team in Motion managed for our team was a great experience from beginning to end. “Lovely and passionate people, objective focused, creative and highly competitive activities that lead my team to interact despite the extremely exhausting long day!!!" “Winners are not those who don’t fail, they are those who never quit. This was a very important lesson we enjoyed during this special day. 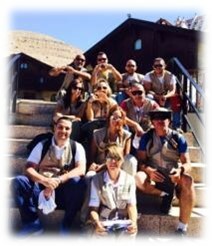 “ It was or 1st experience with TEAM IN MOTION and it was a successful one, my client was so happy about the results he had after your team building event. I will surely be working with you again and will recommend you. It is amazing how one person can make the difference ! In our long list of team building activities providers, TIM was referred to us at the last minute by a colleague and that was the reason why they were the last company we meet . Mrs. Roula Sawan was able to understand our needs from the first minute, show us that passion for her work and company and we immediately felt how easy it will be to deal with TIM. Indeed, TIM was able to translate our vision in no time and bring a new dimension to the message we wanted to convey through the team building activities. Working with them on the preliminary preparations of the event, was rewarding in itself; they involved us in very single detail and tailor made all activities to our milestones. The success of our event is largely due to their professional approach , relentlessly walking the talk with us for three days, and that rare human bond which all TIM members excel at. Words are not enough to tell you how satisfying it was working with you . A big thank you to Marwan the captain on board and to all TIM facilitators. I want to express my joy in the team building activities provided on Saturday. Our Team enjoyed the challenge that was requested, the type of games, and the amazing group engagement they were involved through. I have seen a remarkable difference even on the ground! We laughed, we competed, we learned, and we had a wonderful day. Your entire team was up to the expectations. I look forward to working with you again. Thank you!